Have you always fancied an Australian getaway? Always dreamt of visiting the sunny side down under and throwing some shrimp on the barbie or sinking a few tinnies - Aussie style? Well, what's stopping you?! Is it the horrendous 20 hour plus travel itinery? Or perhaps the instant damage to the credit card even before leaving your beloved homeland? Well, never fear. 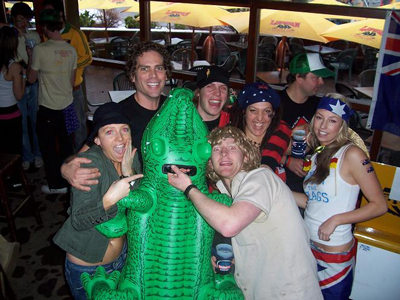 Little did you know that experiencing the Aussie culture is actually a lot closer than you think. Unknown to the majority of those in the northern hemisphere is the pilgrimage of Australians that flock to North America year in, year out, to work and play in major ski destinations. So, with that inside tip, if you are keen to check out Australia but don't have the cash or the time, why not visit Whistler BC. It's a lot closer than travelling all the way to Australia, yet there are enough Aussies there that it's like an Australia away from Australia. Whistler is one of the most popular ski destinations in the world but to Australians it is the numero uno ski destination to experience a winter season. A type of ski Mecca in other words. Visas are easy, jobs are even easier, the snow is good, the terrain is awesome and there is even a Shakespears Pie Shop. Yup, an Australian Pie franchise actually opened a store in Whistler. 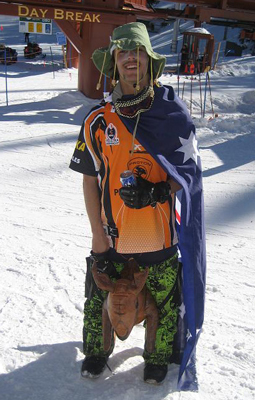 In Whistler, it's not hard to find your local Aussie. There are many. Year after year, the Aussie flag flies proudly on the Whistler lifts, in the ticket-office, rental shops, cafés, pubs and in the ski school. It even gives the Canadian flag a good run for its money. Book your Aussie getaway today. Upon arrival, be greeted by an Aussie at your hotel, head to ski school and let a Sydney-sider book your lesson with a Thredbo instructor. Purchase your lift ticket from a mate from Newie and then get it checked by a bloke from Bris-vegas. Stop for a schooner at noon at the Long Horn - a popular hangout for "local Aussies". After dark, head out and be seated by a Melbournite and then be served by a Canberrian. Then kick-on till stumps with all the other bloody Aussies around for a perfect Aussie holiday. In one day, you'll have experienced most of the Aussie culture at half the cost of actually going there, and you'll have got some decent skiing in too. If Canada isn't your thing, don't worry mate, there are plenty more of us to be shared around. Just south of the border the Aussie equivalent of Whistler is happening in the USA. Again, the student/work visa is easily obtainable. The USA offers a number of different Australian holiday packages. If you are more of a beach person and enjoy sunny days, then head to Mammoth, CA. Plenty of snow here, and with over 300 sunny days a year you can even work on that tan so when you get home, some may actually think that you really have been to Australia! If big cities aren't for you, don't flip out yet. 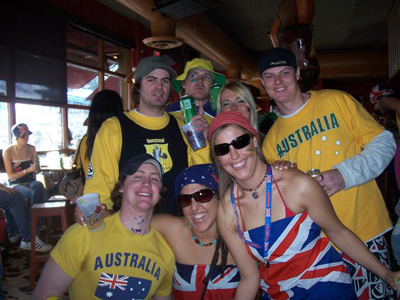 In the Mid-West Aussies have infiltrated popular but smaller destinations such as Summit County, CO and the infamous Vail and Aspen. Here, you can interact on a more personal level with some local Aussies rather than just be surrounded by them like further north. Every year thousands of Aussies head to North America for months, in search of epic snowfalls, deep pow, world-class terrain and an authentic working holiday experience in the mountains. 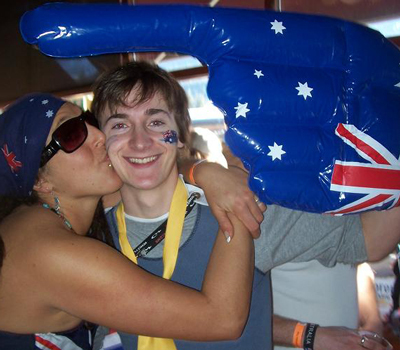 The biggest downside for every Australian leaving Australia for a North American winter, is potentially having to live and work with other bloody Australians. Travelling for 24 hrs and thousands and thousands of kilometers away from Australia only to be met by an Australian at your front door can be heartbreaking for some, but soothing for those who are a little homesick having left Oz for the first time. A downside perhaps for Australians but a positive for those who always fancied a trip to the land of the 'roo! Why waste your savings and travel time trying to get Down Under when the experience could be closer than you think? 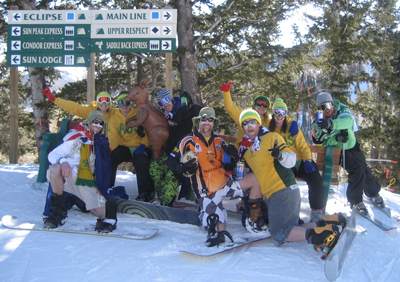 In all seriousness though, Australians and their Kiwi counterparts are found in all ski towns throughout the world. Aussies and Kiwis simply love to travel and being so far away from everywhere else just gives us more reason to leave our sun burnt country. And for those with a passion for colder months, where better to go than mainland Europe and North America? Huge mountains, ridiculous snowfalls, unbelievable experiences and unknown cultures await, and it makes a nice change from the stinking hot Aussie summer months. So come visit Australia in any one of our many ski resort colonies around the world!